In less than a week, cupid will begin shooting arrows into the hearts of couples all over the world. If you happen to be one who celebrates Valentine’s Day, you might be struggling on what to get your significant other. While my permanent state of being single disqualifies me to offer advice on gifts, I can give you some good fashion tips for Valentine’s Day – especially for those pretty feet of yours. One of my favorite designer women’s fashion blogs, The Daily Obsession, recently wrote about what to wear on Valentine’s Day. For many women, deciding what to wear on the day inspired by love can create an overwhelming dilemma. 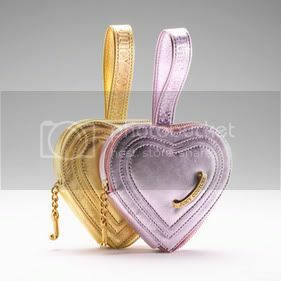 Of all of The Daily Obsession’s suggestions, my favorite accessories are the heart shaped wristlets by Juicy Couture and the pointy flats by Irregular Choice. 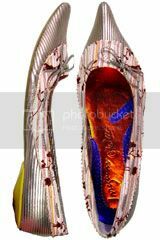 This entry was posted on Thursday, February 8th, 2007 at 1:08 pm	and is filed under designer shoes, Fashion Trends, Shoe Trends. You can follow any responses to this entry through the RSS 2.0 feed. You can leave a response, or trackback from your own site.